Mastique high rise condo owners enjoy resort style living on about 50 acres of real estate including large Lake Mastique. Mastique is unique in its location and views of the Gulf of Mexico. These views are protected for all future generations. The Mastique is surrounded on three sides by the San Carlos Bay – Bunche Beach Preserve. 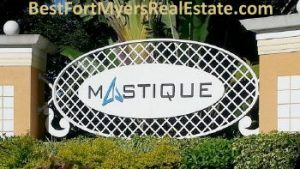 Secluded in south Fort Myers, Florida, Mastique residents are three quarters of a mile from the beach. They are only 10 minute drive to Sanibel Island and Fort Myers Beaches. Mastique homeowners enjoy convenient access to metropolitan Lee County areas. Residences are protected in a gated community, using cutting edge systems and a privately classified elevator access to their units. Mastique has three community associations; one condo association for each luxury tower and a third master association to manage the community amenities. All three associations are financially sound and have built up sufficient reserves. The tropical grounds and properties are professionally managed. Within the community of Mastique are two high-rise residential towers with 132 homes, 66 per tower. Each tower has only four residences per floor, with two penthouses per tower. Superior architectural designs are found throughout to magnificent floor-to-ceiling glass sliders for spectacular views. Mastique tower construction is reinforced concrete insulated floors and walls built to rigid hurricane code standards and designed to reduce noise. Enjoy your Mastique high rise condominium now. Feel free to Contact Shellstar Realty. Our Realtors have several years experience and can help you obtain the best price on your real estate purchase! Search other Fort Myers High Rise Condos.